The most important step to personal financial planning is to start with a basic plan. What is a basic financial plan? We are talking basics here, so forget about debt reduction, emergency funds, retirement accounts and all the fancy phrases you read in personal finance articles. If you are new to financial planning than you want to start small. Starting with the right foundational principles will make your personal planning incredibly successful. The first step is to determine why you want to set up a personal finance plan. I wanted to be able to take vacations and live my life rather than worrying about money. I have more detailed reasons, but honestly, when I broke everything down it really amounted to the fact that I wanted to be in control of my money. Unless you have a reason to revamp your finances and get your financial life in order, you aren’t going to be dedicated enough to change. People need concrete reasons to sacrifice for a better future. You need to have personal financial goals that you want badly enough to put the time and effort into making them happen. So once you have your reasons for organizing your financial life you are now ready to set up your basic personal finance plan. 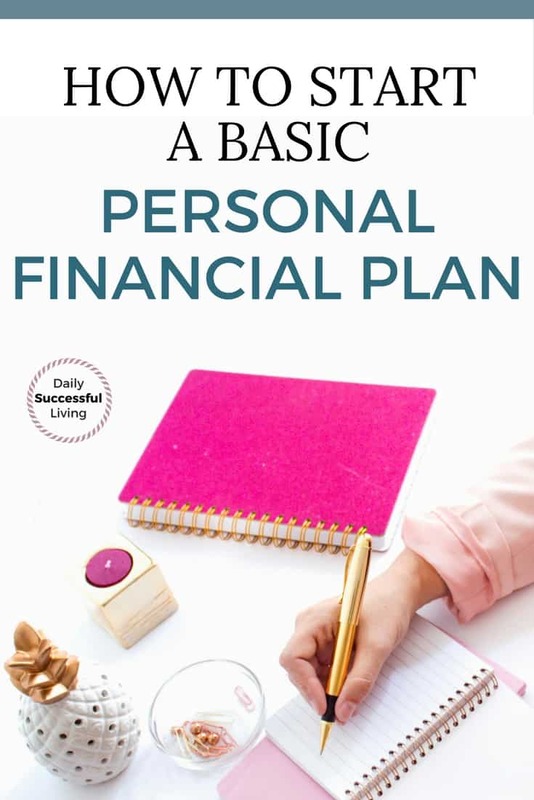 What do you need in a basic personal finance plan? 1. Set your personal finance goals. For most people, this involves budgeting, debt reduction, emergency funds, personal organization, and retirement. Choose two or three areas that need improvement. The important thing is to set specific measurable goals over an extended period of time. Ideally, you will set goals for 1 month, 6 months, 1 year, 5 years . . . . . you get the idea. The most important part of this step is writing down your goals. There is something about writing a goal on paper that gives you purpose and direction. I will save $100 per month. Your goals don’t need to be crazy, they just need to be realistic, timely and very, very specific. If you are trying to save money you may want to set up an account with Digit. I love Digit and am amazed at how quickly I’ve been able to save money. Check out: How to Use Digit to automate your savings in less than 5 minutes. Goals are just dreams until you take measurable steps to accomplish them. The trick here is to write down a clear plan for accomplishing each of your goals. I recommend starting out simple if personal financial planning is new to you. I’ll take my lunch to work 2 days a week and save $16 per week. I’ll use coupons at the grocery store and meal plan and save $25 per week on groceries. On a side note, if you want to save money on your grocery bill I highly recommend The Grocery Budget Makeover program. When I’m setting goals I work backward. For example, using the goal above. I would have made a goal to save $1200 in a year. This means I need to save either $100 each month or $23 a week. If you are new to personal finance than saving $23 a week would probably be the easiest way to accomplish this goal. To be honest, I don’t think the numbers are really all that important. What matter is that you are setting personal finance goals and working your financial plan. The larger numbers will come as you work towards accomplishing your goals. This is important not only for budgeting purposes but is often a reality check for many people. Most people don’t have a clue how much they are spending on groceries, gas, eating out, clothing and all the other random stuff it takes to run a household. You can’t meet your financial goals unless you can learn to control your spending. One of the two unbreakable rules to budgeting is to never spend more than you make. You won’t know how much you are spending until you start tracking your money. I personally use Quicken to track my money. However, it is a more complicated program that doesn’t work well for everyone. I’ve also used Mint which is a free online service through Quicken. I used to use an excel spreadsheet. The method of tracking doesn’t matter, just start tracking your spending. If you are really struggling to control your spending check out my class on How to Find and Eliminate Spending Leaks in Your Budget. I’m a bit biased, but I think this class is life changing and really will help you cut your spending. I know everyone hates the dreaded “B” word, but having a budget is critical to the success of your personal finance goals. Don’t go crazy and overboard. If you’ve never done a budget start out simple and realize it is going to take a minimum of 3-4 months to dial in your income and spending to make a budget work. I do the zero-based budget for my PT work and Aaron’s base pay and then budget his commission on a modified irregular income budget. Choose a budget that works well with your temperament, financial position, and personal preference. The type of budget isn’t as important as having a budget and following it. If you will follow these four simple steps you will have the foundations for a long-term personal finance plan. I’ve known way too many people who get excited about organizing their personal finances, they jump in deep and burn themselves out. Once you have your basic financial plan in place, then it is easy to add the extra’s like debt reduction, retirement savings, emergency funds . . . . the list goes on and on. Once you get started and have control of your money you’ll discover a whole new world. Personal finance is a lot of fun! Grocery Budget Makeover– This class changed my life. I thought I was great at grocery budgeting, but this class helped me save even more money. 5 Dollar Meal Plan– I’m still trying to get my meal planning right, but on the weeks I actually follow through with my meal plans I always save money (and eat more healthy). How to Find and Eliminate Spending Leaks in Your Budget – My class on getting rid of the budget busters that are often ignored when trying to save money. EveryDollar– Budgeting software from Dave Ramsey. I’m not currently using this system, but it is amazing – especially for newbies to budgeting. Envelope Budgeting System – The envelope system is great for cash spending. Digit – An automated saving program that takes all the work out of saving money. You can read my review of this product here – Digit Review: How to Automate Your Savings Plan in 5 Minutes. If you are in debt, you need this book. Ramsey’s baby steps are one of the most effective ways of getting out of debt. I love this book, it is a fascinating read on what set the truly wealthy apart based purely on behaviors they exhibit. It really breaks down the behaviors you need to emulate if you want to be wealthy. If you’ve never read a personal finance book, I recommend starting here. It is a super easy read. The whole story is written as six parables that equate to the Six Laws of Wealth. I read this book for the first time when I was 13 or 14. To this day, I’ll always pay myself first because of the lessons I learned from this book. Great post. Your so right about starting off simple. When I first started my financial journey I tried to do way to much at once and quickly got overwhelmed. Every time I jump in without planning I always get overwhelmed and fail. I’ve learned the hard way the careful planning and simple solutions always work best for me.